It has been said that a man can be measured by the void he leaves when his gone. In this, as in all his endeavors, Jim Hennenhoefer is without peer. Jim was the first of four sons and one daughter. He entered the world July 19, 1941. Growing up in St. Louis, MO, Jim attended Christian Brothers Military Academy. Throughout his life, he spoke fondly of one elementary school teacher, a nun who encouraged him early on to speak up in class. “I would not be the person I am today without her belief in me and her encouragement. “Jim paid this advice forward countless times as literally hundreds of his family members, friends, and colleagues can attest. Even at the height of his personal and professional success. Jim always found time to provide guidance, advice and inspiration to those around him. And he did so in such a way that the recipient of his counsel never felt less than or belittled, but rather walked away with confidence and a new perspective. Continuing at Christian Brothers College High School in St. Louis, Jim jointed JROTC, a step which would chart the course of his adult life. He remained active in ROTC while attending University o Missouri. After graduation, Jim entered active duty in June 1963 in the early days of Vietnam War. He rose to high leadership position in the Naval Intelligence before leaving active duty in 1970. Jim served in the Naval Reserves until he retired in July 2001 with the rank of Commander. Along with gaining fluency in Russian and a love of travel, Jim’s military service experience left him with a lifelong soft spot for fellow members of the service, especially ones negatively impacted by those brutal years. He never missed the chance to offer assistance or an opportunity to his military brethren. Without bringing attention to these personal acts of charity, Jim gave simply because it was the right thing to do. Hoping to join the U.S. Attorney’s Office following active duty, Jim attended Western States University College of Law in San Diego from 1996 through 1970. Upon earning his J.D., he found himself in the middle of a government hiring freeze. With a family to support, Jim found employment as a junior associate at Roden & White, in general practice firm. On one of Jim’s first days in the office, his boss pointed to a pile of dusty files in the corner. “Hennenhoefer, take care of those.” “Those” turned out to be the divorce cases no one else in the office wanted to handle. How like Jim to take the “rejects” and turn them into a professional career filled with achievement. Jim opened his own practice soon after. During the 46 years Jim practiced family law in San Diego, he earned every accolade and award available on the local, state, national, and international level. During his journey toward success, Jim was joined by his beloved Lea. True soul mates and partners in life and in business, Lea and Jim raised Jackie, Stephen, and Heather Hennenhoefer. Legendary travelers. Jim and Lea explored Bedouin camps in Morocco, Maori and Easter Island, Africa and unique experiences and locations everywhere in between. At home, they spoiled their rescued Sharpies’ who always recognized Jim as the Alpha. Not content to rest upon his incredibly impressive professional laurels, Jim continued to seek new challenges and areas of expertise. Along with his dear friend, Gordon Cruse, Jim ventured into the new frontier of ESI (Electronically Stored Information) and taught classes around the country to attorneys and judges alike. In 2016 he was appointed to the California State Bar Judicial Nominees Evaluation Committee (JNE). His work with JNE afforded him the opportunity to interact with attorney outside the family law world and brought him a new group of friends and admirers. Throughout his adult life, Jim collected pocket watches. He had an insatiable curiosity about and love of the watches’ intricate workings and history. He became a true expert in this field and shared his encyclopedic knowledge of these precious timepieces with friends, family and other collectors. 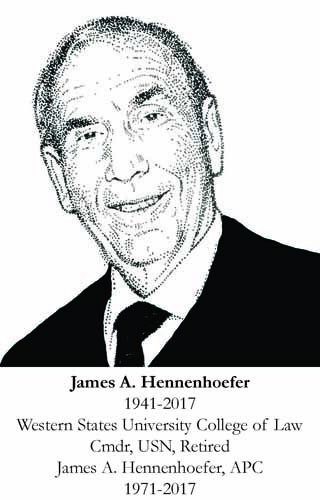 Jim Hennenhoefer’s memory is more precious than the watches he so loved. The stories of his grand spirit, his larger-than-life presence, and his countless ability to love will continue to shine and mark the time after his sudden and unexpected death. Perhaps these treasures will help to fill the unfathomable void his passing has left behind.